Mark Scheifele: A similar story to last year’s 4th overall pick, Ryan Johansen in that he didn’t play in the CHL at age 16 as most top prospects inevitably do. (He was previously committed to Cornell University). Instead, his draft year was also his rookie year in the OHL. Thus, he was nowhere to be found in the top-30 prospects at the beginning of the year, but steadily shot up the rankings, after finishing second among all OHL rookies in points. However, it was his play at the Under-18 World Championships that really endeared him to scouts, as he led Team Canada forwards in scoring (6G, 2A in 7GP) and was named the top Canadian forward as selected by the coaching staff. While a –22 rating is normally some cause for concern, it was actually quite good considering that his team was outscored 231-348 on the year, and the two players near him in scoring (presumably linemates for some part of the year) were –42 and –50. Scheifele is in fact a very heady player who plays both ends of the ice well, and at 6’3, 175, he’s still very much growing into his body. With 53 assists on the year, he appears to be more of a puck distributor, but his performance at the Under-18’s showed that he can also find the back of the net when the pressure is on. 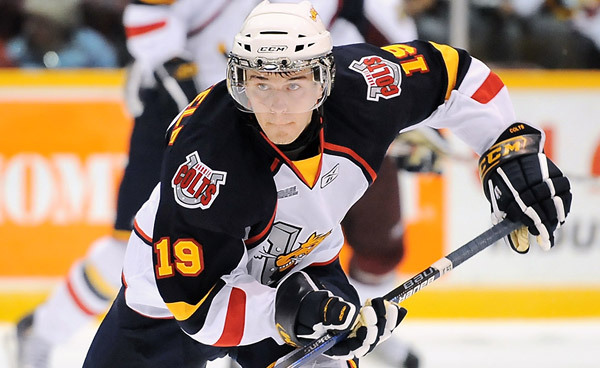 Interestingly, he is the third centre drafted from the Barrie Colts organization in the last 5 years – Bryan Little went 12th overall in 2006, while Alex Burmistrov went 8th overall last year. He is a phenomenal kid by all accounts, and if his work ethic and maturity are as advertised, we’re looking at a nice second line centre at worst. Adam Lowry: At 6’4, 187, Adam Lowry (son of former NHLer Dave Lowry) has the frame of a power forward, and plenty of sandpaper in his game. While his 18 goals and 45 points won’t blow anyone away, he didn’t have much help, as his team’s only NHL-drafted player (Cody Eakin) was traded mid-season, and the team’s leading scorer had only 67 points. It’s difficult to tell how much skill he has, but his offensive output this coming year should tell us a lot about him, as the 18 year old season (generally a player’s 3rd CHL season) usually marks a large statistical increase, particularly for large-bodied players. (See Eric Tangradi, Taylor Beck, Shawn Matthias, Milan Lucic, James Neal, Blake Comeau). Overall, he probably doesn’t have the hands of a top-6 forward, but if he has enough hockey sense and improves his skating, he might be able to play in a third or fourth line role day. He’s a right-handed defenceman who skates really well and has pretty good puck-moving ability. He had some nice playoff stats, with 12 points in 19 games, second on his team among the D. He was officially listed at 6’3, 185, but his father told me that he’s gained 15 pounds in the last 2 months, and that his older brother is 235 lbs. US college hockey is an especially good path for players like Serville who are still developing, so expect him to use all four years of college eligibility before turning pro and playing an AHL season or two. We should have some read on his progress within the next year and a half, but don’t expect him to be anywhere near the NHL for at least 5 years. Zach Yuen: A defenceman for the Tri-City Americans of the WHL, Yuen’s +41 led his team. While he probably wasn’t playing against the toughest opposition every night (probably sheltered on the second or even third defensive pairing), +41 is still a fantastic number at age 17. He’s a very good all-around defenceman, who doesn’t have any paritcular strength but does everything pretty well. Definitely a smart player, but may not have quite enough talent to be a regular NHL defenceman. Seemed like a really nice kid, and he’ll definitely be a good asset in the organization who may get into some NHL games down the road. I’d compare him to Josh Gorges – another guy who was excellent in junior but who wasn’t that big, wasn’t that skilled, and didn’t appear to be more than a good AHL defenceman. If Yuen turns out like Gorges, it’d be a massive steal. Austen Brassard: Similar story to Lowry – Brassard has a big frame (6’2, 180) and played on a very poor team. He was 5th in scoring with 34 points, and 3rd in goals with 19. The leading scorer on his team had only 60 points, as the team’s top player (2nd round pick Richard Panik) was traded mid-season. His team got swept out of playoffs and he scored their only goal of the entire series. Scouting staff is hoping that one of these guys is a diamond in the rough who has more offensive prowess than has been shown thus far. Nice pick for the later rounds, where few or no obvious talents remain. Jason Kasdorf: What a day for this young man. Surrounded by his family, a Winnipegger gets drafted by the home team in their inaugural draft. He’s a big goalie (6’4) who’s heading to RPI, a US college that plays in the ECAC. According to his father, Toronto, Chicago, and New York were also very interested in him, and despite being drafted 158th, he was only the 9th goalie drafted. (19 goalies were drafted in total). Goalies are nearly impossible to project, especially since so much of goaltending is based on non-definable characteristics like resiliency and character. For what it’s worth, he seems like a very calm, level-headed, hard-working guy, with a great family and upbringing. Hopefully he can defy the odds at get one of 60 NHL jobs one day when he’s ready. Aaron Harstad: This late in the draft, getting even a solid AHL player can be considered a success, as there is so little known talent left. Teams generally comb through undersized skill guys and players who played in second-tier leagues like Junior A, USHL, European junior leagues, etc, hoping for a late bloomer. Passed up in the draft last year, Harstad is a USHL defenceman who led his team in scoring among d-men, and also in plus-minus. He’s committed to Colorado College for the next four years, and will have plenty of time to round out his game. This entry was posted in NHL Entry Draft, Winnipeg Jets and tagged 2011 NHL Draft, 2011 NHL Draft Winnipeg, Aaron Harstad, Adam Lowry, Alex Burmistrov, Austen Brassard, Brennan Serville, Bryan Little, Jason Kasdorf, Mark Scheifele, Mark Scheifele 1st round pick, Mark Scheifele Winnipeg Jets, NHL Draft, NHL Draft Winnipeg, Winnipeg Jets, Zach Yuen by Peter Siamandas. Bookmark the permalink.